Photo above: Del. 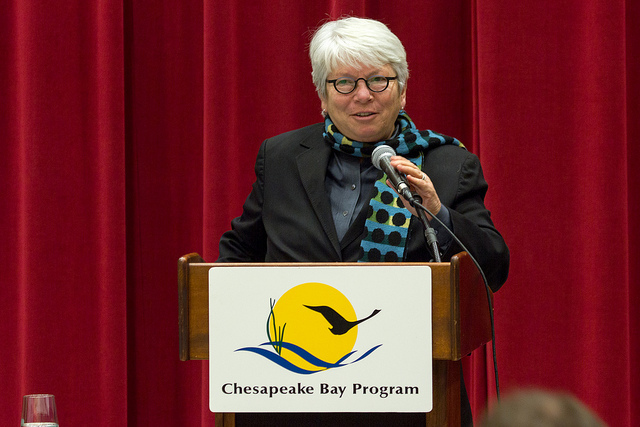 Maggie McIntosh by the Chesapeake Bay Program with Flickr Creative Commons License. Until last week, Del. Maggie McIntosh was an important member of the House of Delegates leadership. Now, suddenly, she’s a Very Important Person. The new chair of the House Appropriations Committee holds the second-most powerful post in the chamber. It even could put her in prime position to succeed House Speaker Mike Busch whenever the Annapolis lawmaker decides to give up his gavel. McIntosh is no overnight success. She’s put in 23 long years as a savvy and loyal worker in the legislative vineyards. It paid off when she was named chair of the House Environmental Matters Committee in 2003. The Baltimore City delegate worked diligently to produce bills that advanced sensible environmental goals without going overboard. She succeeded in maintaining good relations with both environmentalists and the business community. McIntosh always has been a skilled political operative, someone you’d want running your campaign or developing a detailed get-out-the-vote drive. She doesn’t crave the spotlight. Rather, she prefers quietly working to bring opposing groups together to find common ground. She’s also highly regarded by her colleagues. She can be firm but always even-tempered. She likes to enliven conversations with a dash of humor. Her promotion is well deserved, especially after serving as chair of the Environmental Matters Committee for 11 years. She’s also served on three other panels and dozens of joint committees and task forces. She doesn’t come to Appropriations as a novice. McIntosh spent six years previously on this key budget panel. She got to study under one of the keenest minds to chair Appropriations – the late Del. Howard “Pete” Rawlings. Maggie McIntosh was thrust into this new role through a series of mishaps by the Democratic Party. Redistricting dramatically changed many local political maps and persuaded a slew of House Democratic veterans to retire. Then Democratic lethargy on Nov. 4 led to the defeat of many well-established members of House leadership, including Appropriations chair Norman Conway of Salisbury. Add to that a number of delegates who decided to run for the state Senate and you have a recipe for a massive loss of leadership on Appropriations. Eleven of the committee members elected in 2010 aren’t coming back. Most of the panel’s moderate Democrats are among the missing. No wonder Speaker Busch decided to move McIntosh over to run his most important committee. She assumes command at a very difficult time for Democrats, especially those who must grapple with the state’s perplexing budget deficit. New Republican Gov. Larry Hogan Jr. focused his campaign on sharply cutting state spending, Democratic lawmakers will be in a defensive mode when dealing with budget matters. Given the large budget hole facing Hogan, he will cut existing spending levels by a substantial amount. While McIntosh and other progressive Democrats will want to reverse Hogan’s cuts, the state constitution doesn’t allow it: The General Assembly can only reduce the governor’s spending plan. It has no power to increase appropriations – unless it raises taxes. That last option isn’t going to happen this year. Maryland voters sent a clear message they’ve had it with the dozens of tax increases during the eight-year reign of Gov. Martin O’Malley. So McIntosh will be in a bind come January. As a committed urban liberal, she understands the unmet needs in her community. Yet she also recognizes the weak hand she has been dealt. Hogan holds the budget high cards. What McIntosh can do is quietly negotiate compromises with the new governor’s budget team to soften some of Hogan’s budget blows. Meanwhile, her committee will be finding its own share of excess spending in the $16 billion general fund budget. Some of those cuts might give her leverage for striking a budget deal with the Republican chief executive. It’s going to be a tricky few years for McIntosh. She’s proved that she is good when placed in delicate situations. Much will be riding on her succeeding in her new job. Barry Rascovar’s political blog is www.politicalmaryland.com. He can be reached at brascovar@hotmail.com. With the two longest serving presiding officers in Maryland history, the state Senate and House of Delegates, and a majority of their committees, are headed up by people in their 60s and 70s.